You are currently browsing the archive for the December 2015 category. My co-author and the originator of the concept for this blog recently confided that he never imagined that This Day in Presbyterian History would be around this long. Now we are going into our fifth year in 2016. We make no great claims for the blog, but we’re pleased to be able to serve a (generally) growing list of subscribers and others. “Madison Square Garden can seat 20,000 people for a concert. This blog was viewed about 68,000 times in 2015. If it were a concert at Madison Square Garden, it would take just over 3 sold-out performances for that many people to see it. The busiest day of the year was July 4th with 584 views. The most popular post that day was July 4: Happy ‘Presbyterian Rebellion’ Day.’ ” Visitors to the blog came primarily from the United States, followed by the United Kingdom, Canada and 129 other countries around the globe. For the year ahead, we have several plans that should keep things interesting. 2016 will be a big election year, and with that theme in mind we are very pleased that the Rev. Dr. David W. Hall, pastor of the Midway Presbyterian Church in Powder Springs, Georgia, will be writing a series of posts for us, focused on the early American practice of the election day sermon. These posts will run on Saturdays, beginning on January 30th, just before the Iowa Caucus, and will end on October 29th, just before election day in November. Our long-running feature on the Shorter Catechism, written by the Rev. Leonard T. Van Horn, will conclude around April of 2016 and we are working on what will replace that Sunday feature. Many of our posts in past years have been biographical, and while biographies will continue to be part of the mix, there will be a greater effort to be more event focused. We also plan to include more posts on local church histories. 2015 began with a serious health challenge for me, and ended with emergency surgery for my son. The Lord preserved us through it all, and I pray for His blessings in the coming year, that it may prove to be a time of faithful service, of lifting up the name of Christ our Savior, and of doing His will in all that we say and do. If this blog can play even the tiniest part in all of that, it will have served its purpose. 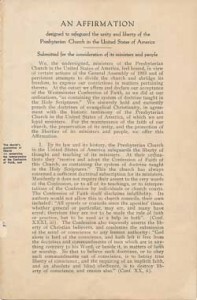 In February, 1938 the congregation purchased the present church site. On March 19, 1938 the cornerstone of the original basement church was laid, and was ready for use by June, 1938. 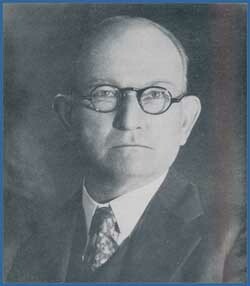 In June, 1938 a call was extended to the first pastor, Rev. Emo Ausema. In the fall of 1939 the congregation decided to build a parsonage of Dutch Colonial Style. Rev. Ausema served Grace Church ofr 6 years. The Lord blessed Grace Church during this time and it grew from 32 to 83 families. In January, 1945, Rev. Bert VanMalsen was installed as our pastor. As the church continued to grow, plans were laid for the superstructure. In the Spring of 1949 construction began and was finished by June, 1950. In January 1954, Rev. Cornelius Reynen became our pastor. Many additions such as a Sunday School Bus, stained glass windows and the Wick pipe organ were made. In November, 1958, Rev. John Beenes became our pastor. The Church and Sunday School continued to grow and the decision was made to build an Education Wing, which was completed in 1962. In August, 1966, Rev. Russell Sybesma became our pastor. Again, Grace Church prospered and grew in many ways. Annex property was purchased at 2718 Indiana (now commonly referred to the White House or Ministry House) and property on 181st was purchased for a parking lot. The Misison program grew during this time. Grace Church started with Gladys Kooy as their first misisonary in its beginning. Supported 6 overseas missionaries by the 1960’s and today supports 12 missionaries in the U.S. and overseas; as well as many Mission and Venevolent Causes. During this time the youth program began to formally develop through youth groups, and GEMS and Cadet programs. Grace first youth pastor, Rev. Ron VerWys was called in 1975; follwed by Rev. Tom Katsma in 1981; Rev. Scott Rees in 1987 and Rev. Dennis Colton in 2009. Mark Morris, Tim Sherman, Joe Greenwald and Scott Dykstra served and contracted Youth Directors as well as several Youth Interns . Rev. Fred Buseman served as an Associate Pastor 1984-1987. Pastor Leroy Childress currently serves as Grace’s Pastor of Youth and Outreach. In 1984 Rev. Tom Katsma, who was currently the youth pastor, accepted the call to the Senior Pastor position. During his ministry Grace Church established a Contemporary Style of Worship, began a Coffee Break Women’s Ministry; had the addition of video equipment, the position of Music Director was added. Grace Church became aware of the changes and needs in the community around them and made changes to continue to reach out to the community. In 1992, Rev.Don Schmidt was called as Senior Pastor. His ministry was cut short due to cancer and he went to be with the Lord in April, 1994. While at Grace his vision for reaching the community of Lansing was a stepping stone for the future of Grace. Rev. Andy Nearpass served Grace Church as it’s Senior Pastor from 1995-2014. During this time Grace Church saw the continuance of a strong youth program; development of small groups; sent numerous mission teams out abroad and into the community, many facility updates; and a focus on prayer and God’s Word. Pastor Leroy Childress was called as Senior Pastor on June 21, 2015. This marked Grace’s first pastor as a PCA church. After much prayer and contemplation, on September 20, 2014 the Grace Church Congregation voted to transfer from the Reformed Church in America (RCA) to the Presbyterian Church in America (PCA). On October 30, 2014 the Illiana Classis of the RCA voted to approve the requested transfer. As Grace Church looks to the Lord for guidance in our future and where He will lead us, the mottos of previous years ring through: “Fear Not Little Flock,” “Hither to the Lord has Blessed Us,” “Living and Sharing God’s Wonderful Grace,” and “Reaching…, Healing…, Sending,” “Connect, Grow, Serve, Go.” Grace Church continues to strive to live out it’s mission: Raising up followers of Jesus who impact the community and beyond with God’s love. Q. 56. — What is the reason annexed to the third commandment? A. — The reason annexed to the third commandment is that however the breakers of this commandment may escape punishment from men, yet the Lord our God will not suffer them to escape his righteous judgment. Scripture References: Deut. 28:58-59; Ps.139:20; Ps.83:18; Zech 5:3. The breakers of this commandment might escape punishment from men because so many times those in authority are just as guilty as those who break the commandment. It is so many times a case of the natural man dealing with the natural man and the things of God are bypassed. 2. Who are they that take the Lord’s name in vain? The Bible teaches that those who take His name in vain are his avowed enemies. (Ps. 139:20). 3. What should be one of the greatest motivators to hinder us from taking His name in vain? As believers simply the words “the Lord our God” in this question should motivate us toward recognizing His glory and this should fill us with reverence and a godly fear. It should burden our hearts with guilt if we should break this commandment. 4. Will those who take the name of the Lord in vain escape judgment? Those who break this commandment will not escape judgment, because God is righteous and has promised that they will be punished. 5. Would you call His promise a threat? Yes, it could be called a threat in that divine vengeance is aimed against the person breaking the commandment. 6. When will those who break this commandment be punished? There are two times the breakers of this commandment could be punished. Sometimes they are punished in this life as is seen in Deut. 28:58, 59. Sometimes the punishment will not be given until the hereafter. However, it is certain they will be punished. Making this a daily prayer would be good for us all. And yet, there is danger involved in the speech of the believer. The Bible states the danger very well: “This people draw near me with their mouth, and with their lips do honor me, but have removed their heart far from me.” (lsa. 29:13). The danger is ever present that we talk a good religion, but because our hearts are not right before the Lord we neglect to follow His ways. We are eager to be heard by others who love the Lord, but inwardly we are saying “No!” to Him as He deals with self inside our hearts. Indeed, our prayer should be for Him to set a watch before our mouths, and for the Holy Spirit to increasingly minister to our hearts. The third commandment makes it plain that we will pay for dishonoring Him with our lips. The payment will be in this life or in the next. We know full well that the unbeliever will be punished, but sometimes we forget that we too will have to suffer. May God help us that our words may ever glorify Him, words lifting high the Lord Jesus Christ to a wicked and perverse generation! (Ps. 19:14). Quiet workers, in God’s kingdom, are often found to have an abiding influence. 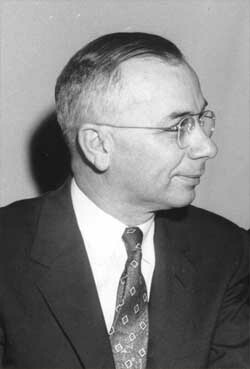 The Reverend J. Marcellus Kik was one of the first three members of the editorial staff of Christianity Today, from its inception in 1955. When the magazine was initially planned, advice was sought from hundreds of men in this country and abroad. None of the replies showed more depth of understanding and vision for this Christian witness than Mr. Kik’s. His long experience as a pastor and as editor of a church paper in Canada enabled him to make a significant and lasting contribution to this maga­zine, which he served as associate editor. About 1960, Mr. Kik assumed the post of research editor. In that capacity he spent many months in Europe, particularly in Switzerland and Holland. In Geneva he received permis­sion to study all minutes’ of the consistory for the period of Calvin’s great ministry in that city, and also the min­utes of the city council dur­ing the same years. Mr. Kik had these minutes micro­filmed and then translated from seventeenth-century French into English. These indefatigable efforts brought to light the clear distinction Calvin made between his duties as a Christian citizen and the spiritual role of the corporate church in society. During 1927 and 1928 Mr. Kik attended Princeton Theological Seminary, and he was part of the first class graduated from Westmin­ster Theological Seminary in the Spring of 1930. For the next twenty­-two years he held pastorates in Canada, where he also conducted a weekly radio program for thirteen years. He wrote a number of religious books and served on the Board of Trustees of both Westminster Seminary and Gordon College and Divinity School. Mr. Kik continued his Calvin research up to the week of his death. In 1964, he underwent radical surgery from which he never fully recovered but which never daunted him in his work and witness for his Lord. He died in Philadelphia on October 22, in 1965. Jacob Marcellus Kik was born in Phillipsland, Netherlands on 24 December 1903. He attended Hope College, graduating in 1927 and then went on to Princeton Seminary, attending there from the Fall semester in 1927 through the Spring semester of 1929. He then transferred to the newly founded Westminster Theological Seminary in the Fall of 1929 along with other Biblical conservatives. He graduated from Westminster in May of 1930, was ordained by Miramichi Presbytery on 29 October 1930 and pastored the Bass River and West Branch churches in New Brunswick, Canada from 1930 to 1933. “A pattern had been established. Independent Presbyterian journals presented an opportunity for minorities to present their views and gain an audience. Only a decade after church union, a new independent journal would appear. Bible Christianity owed much to the fundamentalist-modernist controversy of the 1920s and 1930s from which Canada was largely spared. 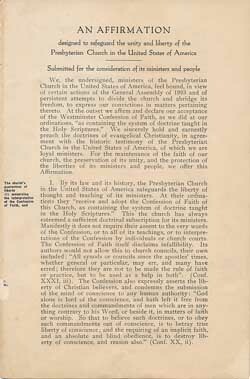 The magazine, supported by W. D. Reid, minister of the well-heeled Stanley Church, Westmount, Montreal, became known for its outspoken opposition to what it perceived as liberalism in the continuing church. 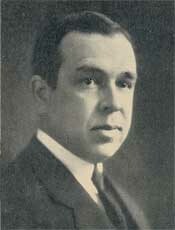 Bible Christianity was edited by J. Marcellus Kik, a Presbyterian minister who was among the first graduates of Westminster Seminary after it split from Princeton in 1929. Kik had been minister in New Brunswick but came to Montreal in 1936 and served there in various capacities (for a time as full-time editor and religious broadcaster) from 1936 to 1952. [The later Bible Presbyterian, which was published out of New Glasgow, Nova Scotia, by dissident Presbyterian minister Malcolm MacKay. ]” — Note: Vol. 1, no. 1 of Bible Christianity is now posted in PDF format. In 1661, he applied to the Presbytery for licensure in the ministry. Preaching in a variety of situations, he was quickly recognized by his hearers for his great ability in the Word of God. However, his ministry soon came to an end as it became obvious that he wouldn’t compromise his convictions, just as his father before him. Preaching his last sermon in a church in Edinburgh, he had a sentence in it which marked him for remembrance by the Prelate forces of his day. He said, “the Church is persecuted by a Pharaoh on the throne, a Haman in the State, and a Judas in the Church.” The identification was obvious to all in the pews that day. Forced to leave his beloved Scotland, the young twenty-six year old would spend the next three years in Holland. On his return to Scotland, the situation had not improved any and there was a spark of rebellion in the air. That spark was ignited, as my post on November 28 indicated, at the Battle of Rullion Green. Hugh McKail was among the nine hundred in the Covenanter ranks that day. But his own physical weakness removed him before that great battle arrived, and he traveled to Edinburgh instead. There he was arrested by the authorities, not so much for his Covenanter attachments as for his statement made in that Edinburgh church some years before. Could Hugh McKail have compromised his convictions and avoided suffering and death? Certainly, and many did. But this young man was reared by a parent who by his example remained steadfast to the Word of God and the testimony of Jesus Christ. With such an example like that, it is no wonder the young minister was given over to sacrifice, in loyalty to both the Living and Written Word, come what may to his physical body. Addressing all parents reading these posts on Presbyterian history: Your life preaches all the week. Are those in your family being helped or hindered to follow the Living and Written Word? After the resignation of I. N. Hays, the Middle Spring Presbyterian Church remained vacant for one year and a half, though the pulpit was usually occupied. Several attempts were made to secure a pastor, but on account of division of sentiment in the congregation and other causes, these attempts proved fruitless, until the autumn of 1869, when Rev. D. K. Richardson was called, and having accepted, commenced his labors Jan. 1, 1870, and was installed May 6th of the same year. He resigned the pastoral charge on December 21, 1871. The first year of the labors of Mr. Richardson in the Middle Spring church, was one of great discouragement, which arose from an absence of the convicting and converting presence of the Holy Spirit, and disharmony in the church. During the latter part of this year, things became more settled, and there was an increased interest in the preaching of the Word. 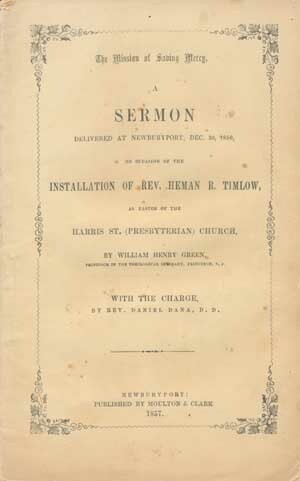 On the third Sabbath of January 1871, during the afternoon service at Newburg, the presence of the Spirit became manifest. It proved to be the Prophet’s cloud from the sea, and the harbinger of a gracious revival, which extended pretty generally through the congregation, and resulted in the accession of forty-seven persons to the membership of the church. During his ministry here the church was no doubt greatly benefited spiritually. The pastor was growing in favor each day with the people, and we have no doubt the dissolution of this pastoral relation was the saddest and most unexpected in the history of the church. This took place December 21, 1871, he having received a call from the church at Greencastle, Pennsylvania. Rev. D. K. Richardson was born near Shanesville, Ohio, January 7, 1835. His father was for many years a ruling elder in the Church of Berlin, Ohio. Mr Richardson pursued his classical studies at Vermillion College. He afterwards engaged in teaching and the study of law, with a view to the profession. While engaged in teaching he was truly and happily converted to God, being then at the age of twenty-two, and at once turned his thoughts towards the ministry of the Gospel. In the fall of 1861 he entered Western Theological Seminary at Allegheny, and completed a three years’ course. In the spring of 1863 he was licensed by the Presbytery of Maumee, and in 1864 was ordained by the same Presbytery, and installed over the churches of Napoleon and Bryan. He spent with these churches six or seven years of most earnest, devoted, and successful work. His ministry was greatly blessed. In 1870 he was called thence to the Middle Spring Church, Cumberland county, and before the close of his second year to the church in Greencastle, where he was installed February 10, 1872. This church he served until his death, August 20, 1877. Prior to his death he had accepted a call to Vincennes, Indiana, and amid his preparations to remove thither, was suddenly stricken down. In his brief ministry of thirteen years he was very successful, winning many to Christ by his impressive preaching. His labors in every charge were blessed with revivals. He was growing in spiritual and intellectual power, and his early deaath was deeply regretted. Minutes of the Synod of Harrisburg, Volume 12, 1881, p. 59.